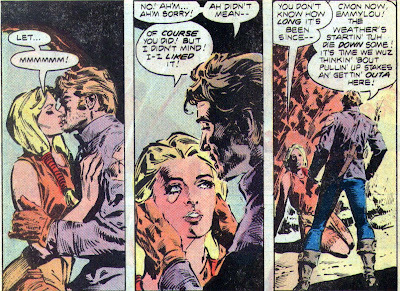 Matching Dragoons: Jonah Hex #50 "The Hunter!" 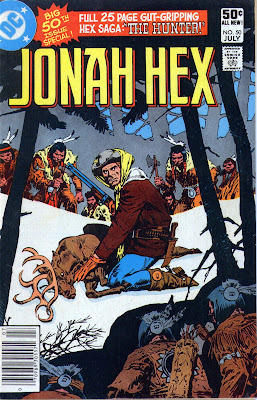 Jonah Hex #50 "The Hunter!" The snow is very deep and Jonah is heading out to hunt some deer. Mei Ling follows him out, wondering how long he'll be gone. Jonah says he doesn't rightly know, but he has to get food so his son will grow up big & strong. Mei Ling asks "What if it's a girl?" to which Jonah replies that they would hang onto her until they got tired of her and then throw her down a well. Jonah mounts up and tells Mei Ling to take it easy and he'll be home, luckily before tomorrow, but before tomorrow night at the latest. As Jonah rides off, Ling hopes inwardly that Jonah returns before tomorrow. Today is November 1st, Jonah's birthday and she is working on a surprise for him. Jonah has told Ling about SOME of his childhood and she wants the day to be a little bit special. Out in the woods, Jonah spots a deer fairly early, but being upwind, he isn't able to get a good shot before the buck bolts. Jonah mearly wounds him and has to take off tracking the wounded beast. Tying up his horse, Jonah sets off through the snow on foot. Shortly thereafter, Jonah finds the deer, dead, in a small meadow and he kneels by the animal and starts to dress it (I'm talking about cutting it up, not putting a parka on the dang thing!). 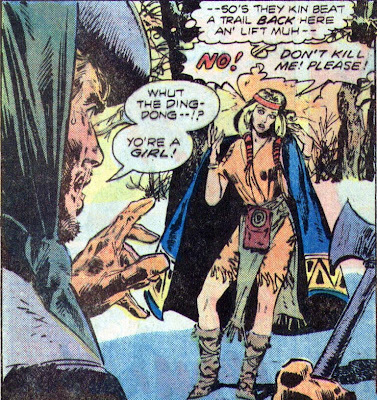 But this is Jonah Hex we're discussing here and any run of good luck has to be countered with and unequal and opposite reaction of bad luck. This time, it's several Crow who decide to take advantage of Jonah's back being turned. Jonah, hears them and as he is turning with his rifle, he catches and arrow in the left shoulder and opens fire on the charging Indians. He drops two of them before his rifle jams and he has to resort to using it as a club-upside-the-head on one Indian. Another jumps him from behind and Jonah is able to toss the brave over his shoulder so that the Indian's skull smashes on an exposed boulder. Jonah turns to see one Indian remaining, he bends over to pick up a tomahawk and he charges the Indian. Emmy Lou Hartley of the Hartley Party, a group of settlers that was traveling through the area about 3-4 years ago. The wagon train was attacked by Crows and everyone was killed. Emmy corrects Jonah in that three women survived; herself, her sister, and her cousin. Emmy's sister turned a rifle on herself rather than be taken prisoner and the cousin was murdered for refusing to become a bride to a Crow warrior. Emmy did what she had to in order to survive. For almost 4 years, she labored as the wife of Eagle Who Stands and just three days ago she saw a chance to escape. The four Indians that Jonah killed were a party sent to bring her back. Jonah says that he will be happy to get her back to civilization, but he has to finish prepping the deer and the snow is starting to fall. Once they get back to Jonah's horse, he has Emmy Lou ride while he leads the horse. The trail is drifting with snow and Jonah doesn't want to take any chance getting lost. Remember what I said about bad luck? Well, it shows up again in spades. A large snow owl startles the horse who rears up and hits Jonah in the head with a hoof. Amazingly, Jonah stays conscious, but Emmy Lou panics and keeps pulling back on the reins. The horse continues to buck and then the horse and Emmy fall off the nearby cliff. Emmy jumps and manages to grab a small tree in the cliff face, but Jonah is unable to reach her. He quickly unwraps his scarf and Emmy is able to grab onto that. Jonah starts pulling her up and grabs her hand just as the scarf snaps in two. Jonah hoists Emmy Lou up on solid ground and the storm has intensified. Jonah decides that they need to take shelter in a cave. Jonah and Emmy start to hunker down in the cave to wait out the storm when... remember what I said about bad luck? Not only does it come back in spades, but it has all the trump as well because a bear, a large, mean, fighting grizzly comes out of the darkness. It's pretty clear that Jonah put the moves on her, but he comes to his senses and starts carving up the bear to replace the lost deer meat. The storm lets up and Jonah & Emmy head out for the McCabe ranch where Emmy can stay with the McCabes. Emmy is wanting to know what's wrong and if she did something wrong, but Jonah gruffly refuses to talk about it (and of course he doesn't tell her that he's married). When they finally get to the McCabe ranch there are some quick explanations about Emmy, the bear, the missing gear and Jonah needing to head out. Emmy asks if she'll see Jonah again and Mr. McCabe laughingly says not if Jonah's wife has anything to say about it. Emmy is stunned and Jonah heads home. Once Jonah gets home, Mei Ling is full of questions about Jonah's injuries, why he's riding a different horse.. Jonah explains about the bear and how it's wrapped up in that blanket. Mei Ling points out that it is a woman's shawl, Jonah explains that it belongs to Mrs. McCabe. Mei Ling says that it looks Indian and Jonah mildly blows up, saying that he doesn't want to have a fight. Ling apologizes and escorts Jonah into the cabin for his surprise. Mei Ling is going to fix him a bear steak and then shows Jonah his birthday cake. Jonah is 37 and it's about time he got a cake. They embrace, confess their love for each other and we're left with a parting shot of the Hex farm in the snow. Timeline - Wow, where do I begin? It's been stated several times that Jonah was born in 1838. Now we have a date, November 1st. If he's 37, then this story falls at the end of 1875. Like almost a ton of other stories. We know that Jonah and Mei Ling have been married long enough to start the farm and harvest corn, so they have been married at least since March or April. That leaves very little time for a whole ton of non-Mei Ling adventures to take place. Regarding what happens AFTER this story, we have 42 more issues that have a well developed continuity (with the exception of probably 6 issues that have no reference to Mei Ling or Emmy Lou) until the unthinkable happens and Jonah disappears in 1875. (?!) I had postulated in other forums that the dates after this story were all wrong and that Jonah probably vanished in 1878 but I've been rethinking that. From what I understand about dating historical occurances (which is very little) one must go with the bulk of the evidence. If a majority of people say that something happened on a particular date, then the one reference that counters that is considered suspect. This is the position that Mei Ling's reference to Jonah's 37th birthday falls. Susan Hilliwig has suggested that Mei Ling was wrong, she got Jonah's age wrong. But trying to pry this into what we already know about the Jonah Hex timeline, just makes my head explode. We can't really be placing this one as early as 1872 because we then run into several problems regarding the dates of Quentin Turnbull and El Papagayo. I just don't know what to do. It would be easier to go with 1875 and say that the other texts are wrong. Now about the story. I really enjoyed this tale. It gave us a new ongoing character, more tension in the Hex household but also we see more of Mei Ling's tenderness. She's pregnant and is wanting to help sooth Jonah's tortured childhood. I also enjoy Westerns that take place in the snow, probably because there are so few of them. On a final note, my Lovely Wife recently asked (out of the blue) "Was Jonah ever unfaithful with Emmy Lou?" My jaw hung open. "Why do you ask that?" "Well, I was bored and read that issue you had laying around. Did he?" I gave her a nickel explanation of what happens next, all of you, will have to wait and see what unfolds. Next Issue: Jonah gets called a coward, Woodson slaps his son around, and a major turning point in the life of Mei Ling. Trying to figure out what year things took place in a Jonah Hex book is really complicated. That's why I try to ignore it, and let YOU do the work. Poor Jonah. Every time that he rescues a woman, she does something stupid. Like kill his horse and rip his scarf and get lost, and then bear-fighing. And then he has to figure out what to do with her. At least he got some cake afterwards. It's a little known fact that the name Ling, in China, was given to little girls with the same frequency that the name Edith was handed out here in the US (at least in the 1800s according to babynames.com). So I guess that, at least on his birthday, Jonah had his cake & Edith too.